Here is a detailed tutorial on how to construct and use aluminum ribs in your A-Plane. Take a look at the rib to the left. It comes from a modern production ultralight. It is used on the majority of tube and fabric ultralights. They will work great on your A-Plane too. Plus: You can make all of them and install them on your wings in just a few hours. Ready? Let’s get started. To complete the list of materials for the ribs, we will need two 1/8 inch diameter by 1/2 inch long stainless steel rivets per rib. These are used to attach the rib to the spars. The rivets are located on page 101 as shown below. The ability to bend aluminum tubing into whatever shape you want will be a skill you will use often. If you are into light airplanes, this can also save you money. The good news is that once you know the basics, it’s really easy to do. A tube by nature resists bending. The whole key to bending it is to have a form for it to go around which supports the tube fully, while you are applying force. This prevents a kink in the tube. There are two ways to accomplish this: You can make your own tubing bender out of wood, or you can buy a tubing bender at any home supply store. They cost around twenty dollars and luckily for us 1/2 inch and 1 inch (the size bender we need) are the same common sizes used in plumbing. This jig doubles as a tubing bender, and rib assembly jig. The diagram above is to give you ideas, and not necessarily the only way to do it. Find a board that is at least 60 inches long, 8 inches wide, and at least half an inch of thickness. You want one that is perfectly flat. The first thing you want to draw on the board is the two round white circles you see, which represent the spars on the wing. These are labeled S. These are exactly 54 inches apart, as measured from the leading edge of the front spar, to the trailing edge of the rear spar. The white lines are our rib, and we want to lay all of our formed ribs on this template to ensure that they are the same. The piece labeled C is only used if you are bending the rib on the board. It must be at least half an inch thick. Next, we will attach the plastic fittings and then to the wings. Now we attach our poly tip rib end fitting and the rear spar fitting. On your rib jig, assemble the rib with these three parts. Make sure you have deburred the tubing before using it. 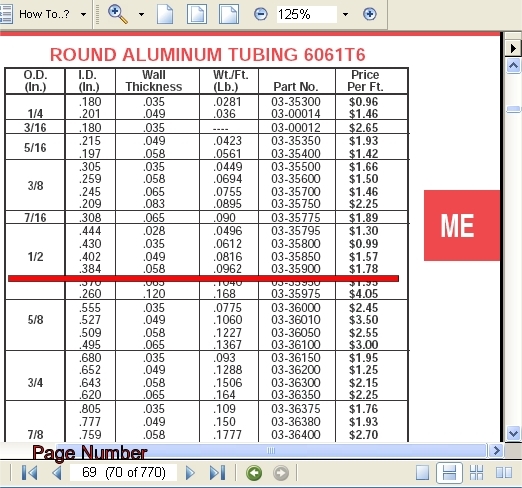 You secure the plastic fittings to the aluminum tube using a center punch. This slightly dimples the tubing inward in one spot, to pinch and hold the plastic fitting. Please remember, we are only trying to keep the fittings from falling off the rib, as once they are put on the wings, the fabric will keep them in position. To determine where to place the aluminum ribs on each wing: First, the wing you are working with should be supported evenly on two sawhorses. All of our measurements are taken from the wing attach part of the front spar. There are ten ribs per wing, for a total of twenty. At each location, place a mark on the tube where the rib will go. Mark both the front and the rear spar. Make all of your marks first, before attaching any ribs. The very first rib is placed 2.5 inches away from the edge of the tube, towards the wing attach part. The rest are all spaced about 15.75 inches on center from each other. If there are any protrusions from the spar, such as a strut attach, etc, simply joggle the rib slightly left or right. The idea is to space each rib evenly with each other in the space allowed. Once you are satisfied with the look, go ahead and attach. This completes the tutorial on aluminum ribs.